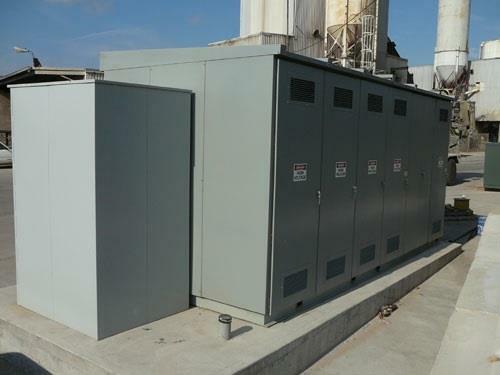 Clayton Block Company procured AEA services to perform electrical service upgrade (from 4.6KV to 13.2KV primary), installation of new switchgear and metering equipment, outdoor cubicles transformers, and new electrical feeders to various building and transformers. Existing 4.6KV service was removed and a new 13.2 KV service was installed to feed the increased demand at the plant due to addition of new heavy plant equipment machinery. AEA performed field investigations and coordination with Utility Company to confirm the locations of proposed switch gear and metering equipment. AEA developed 13.2 KV switchgear drawings of breaker control schematic which included switchgear, batteries, charger and AC Controls for heaters, outdoor 13.2 KV metering/switch gear cubicles and concrete pad for equipment installation. Confirmed the locations of new transformers and proposed duct back. Developed technical details of the 15 KV rated underground cable, i.e size, insulation, current and temperature rating etc for feeders from the main switch gear to the step-down transformers. AEA designed 13.2 KV switch gear and metering equipment, equipment panels & equipment pad, panel board schedule, step down transformers and feeder conduit and wiring, junction boxes. AEA designed 480/277 volt secondary power distribution system to feed the plant equipment. AEA coordinated the proposed design and staging with the plant representatives to avoid any unplanned power outage to existing plant equipment and machinery. AEA developed construction plans, construction details, single line diagrams, panel schedule, and construction specifications.